Good Morning and Happy Tuesday. Well it's a rainy one here in CNY but that just makes for a great crafty day, right? Anyway, today I want to share with you a brand new product from Stampin' Up!, the Love Today Planner Kit. I'm sure you're aware, but if not, planners have become all the rage these days. Not just for keeping track of appointments and where you need to be and when, and which kid has a sporting or musical event and where so on and so forth, but they have evolved into a memory keeping source as well along with being another opportunity to express your creativity. And isn't that what we're all about? Expressing our creativity? 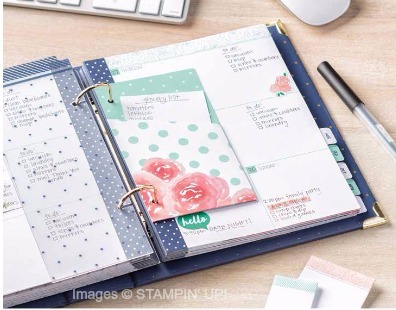 Well, I don't know about you, but I do use a planner to keep myself on task with the multiple meetings that I attend for my day job as well as keeping my stamp class schedules and workshop events along with crafting events that I am involved with. Without my planner, I would be wandering aimlessly and no one wants that! It's beautiful in Night of Navy with gold foil polka dots along with the beautiful gold corners. It really is just as beautiful as it is functional. It's ready for you to personalize and make all your own. Another great feature, on the monthly pages, the Month is pre-printed at the top however, the dates are left blank. 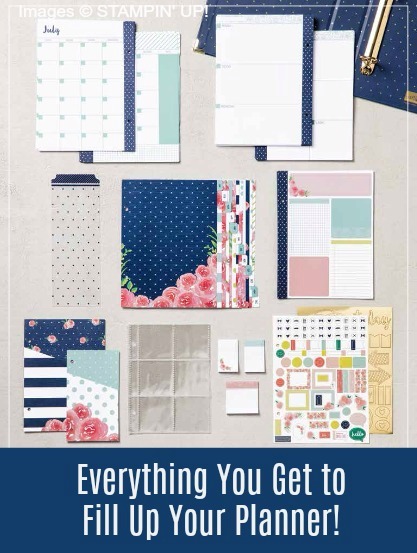 This will allow you to begin using your planner whenever it's convenient for YOU! If you want to start in September with the new school year, then that's when you begin so you would set up based on that and your July dates will be correct for 2018 not 2017 if it were printed. So, if you're a little OCD like me and HATE starting in the middle of a new planner, this is PERFECT!